The Neatest Beggar’s Purse from Jean-Georges! Dorothy Wang had dinner at Jean-Georges in Beverly Hills two weeks ago and said her Beggar’s Purse was the cutest and fanciest she has ever seen. Suga agrees! It was filled with Ossetra Caviar and Vodka cream, tied with a chive and topped with a gold leaf. Jean-Georges Vongerichten is a famed French Chef that is known to craft his dishes with blends of French, American and Asian influences. His Fine Dining Restaurant, Jean-Georges in Beverly Hills has 3 Michelin stars! Jean-Georges is also in New York, overlooking Central Park. Last Sunday evening for a dinner date, I headed up to Strawberry Hill in the heart of Jamaica’s Blue Mountains in Irish Town, just 20 minutes from Papine by the foot of the hill. Upon arrival, the breathtaking, picturesque view of the mountains, botanical gardens, Georgian-style cottages and infinity-edge pool, formed the perfect ambience for romance. We were greeted pleasantly by 2 waitresses simultaneously that happened to be coming from different directions. Now that was a reflection of their eagerness to show hospitality and a sign of good things to come. It was Marva who seated us and issued or menus instantly. I was excited to see what their new French Chef had to offer. Over the years, I think Strawberry Hill has had their ups and downs where good quality food is concerned, but thankfully less of the latter. They seem to have a commendable reputation regardless. I heard Chef Martin started at Strawberry Hill in March of this year. The variety of Appetizers popped out more to me compared to the Main dishes, however I am sure if persons wanted to try something they haven’t had in a while, they would surely find something they could choose. I started with the Smoked Marlin cannelloni with cucumber and caper dressing. Doesn’t that sound interesting? It surely was. A unique blend of flavours that worked well together teasing my taste buds. Braised shank of Lamb with Jerk and orange sauce, mashed pumpkin and glazed vegetables followed, tender to the cut and succulent. I was also pleased to find out that they buy local. Their meats are from a variety of local farmers, particularly small farmers, such as St. John’s Boscos, a local butchery in Mandeville, which funds orphans and teaches them the trade. I indulged in warm Bread Pudding for dessert, of which it was the sauce that enhanced the taste. I tried a bit of the Stuffed Puffs with Coconut Ice Cream that was enjoyable but seemed to be missing the Hot Chocolate sauce that was mentioned on the menu. Other tempting items on the dinner menu included Escoveitch Shrimps, stuffed and spicy Crab Backs, Tomato and Mozzarella Stacks salad, Vegetarian Lasagna with Callaloo and Tomato and an 8oz of Tenderloin of spicy Grilled Beef. A wide selection of Beverages are available as well. Ladies should have Marva mix them that special Piña Colada, its fire! The service was on point throughout, ‘on cue to top up my glass’ style. Food came out in a timely manner but still with sufficient time to converse and enjoy the lovely ambience. The serving sizes were decent, slightly more than some restaurants but just right because I left feeling full but not stuffed. 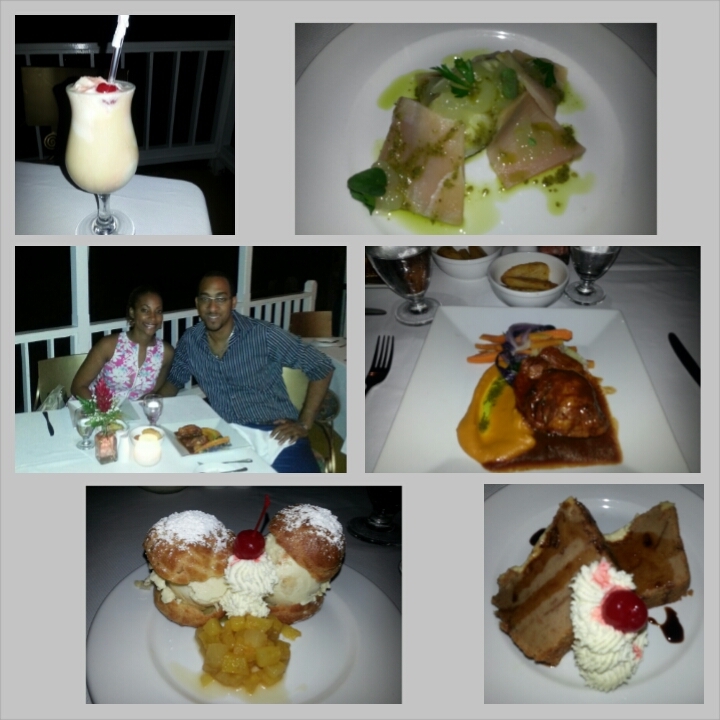 Strawberry Hill continues to impress and sustain excellent service with an ambience like no other.